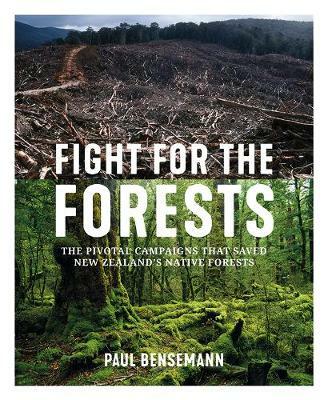 "The greatest success story of New Zealands modern environmental movement were the pivotal campaigns between 1970 and 2000 that stopped the destruction of our native forest. They began with the battle to save Lake Manapuri from being flooded, and by 2000, all the significant lowl... read full description below. 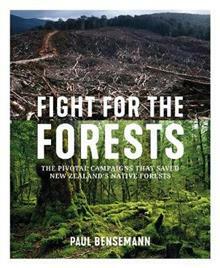 The greatest success stories of the modern environmental movement in New Zealand were the public campaigns to save our native forests, beginning in the 1960s with the battle to stop Lake Manapouri being drowned. By 2000, all the significant lowland forest in South Westland had become part of a World Heritage Area, the beech forests of the West Coast had largely been protected, Paparoa National Park had been established, the magnificent podocarp forests of Pureora and Whirinaki in the central North Island had been saved from the chainsaw, and many other smaller areas of forest had been included into the conservation estate. Fight for the Forest tells this remarkable story, how a group of young activists became aware of government plans to mill vast areas of West Coast beech forest, and began campaigning to halt this. From small beginnings, a much larger movement grew, mainly centred around the work of the Native Forests Action Council, whose young, committed and extremely capable conservationists tapped into huge public support and changed the course of environmental history in this country. Mainly based on interviews with key players, author Paul Bensemann has recorded a largely untold but significant and inspiring history, one that reminds us that change for good is always possible. Describing himself as a conservation `foot soldier', Paul Bensemann was first involved in native forest issues at age 19. He drove to Fiordland in 1972 from his Motueka Valley home specifically to work on the `Save Manapouri' campaign, before a short spell as a national park field worker. Four years later, he joined the New Zealand Forest Service head office as a spy for the Native Forests Action Council (NFAC), spending nine months leaking information that the department was refusing to release on its planned industrial-scale West Coast `beech scheme', for example, on soils, freshwater fish, insects and birdlife. In 1978, while secretary of NFAC's Wellington branch, he and wife Elsie Ellison joined the Pureora tree-top occupation, helping protest leader Stephen King with community liaison at Mangakino and the milling town of Barryville. The couple did similar iwi-liaison work during the Whirinaki campaign over the next two years. Paul left the movement during the 1980s and 1990s to work as a newspaper and radio journalist, based for most of time in the parliamentary press gallery. He became politically active again in the late 1990s and early twenty-first century as a senior staff member for the Green Party. This included public relations support for Green co-leaders Rod Donald and Jeanette Fitzsimons as they backed the Native Forest Action (NFA) tree-top campaign at Charleston. Paul then helped the MPs in parliamentary backroom deals that led to three parties - Labour, Alliance and the Greens - end logging of native trees on Crown land by March 2002. His two previously published books are Tragedy at Aramoana, 1991, and Lost Gold, 2013.